Since 2018 has been dubbed the Year of the Bird by the National Geographic Society and yesterday was National Bird Day, it seems fitting that the first blogpost of the year should be about birds. Few birds represent the wild majesty of winter like Snowy Owls, but the birds that flit about just outside our homes all year long can be just as beautiful in their own right. 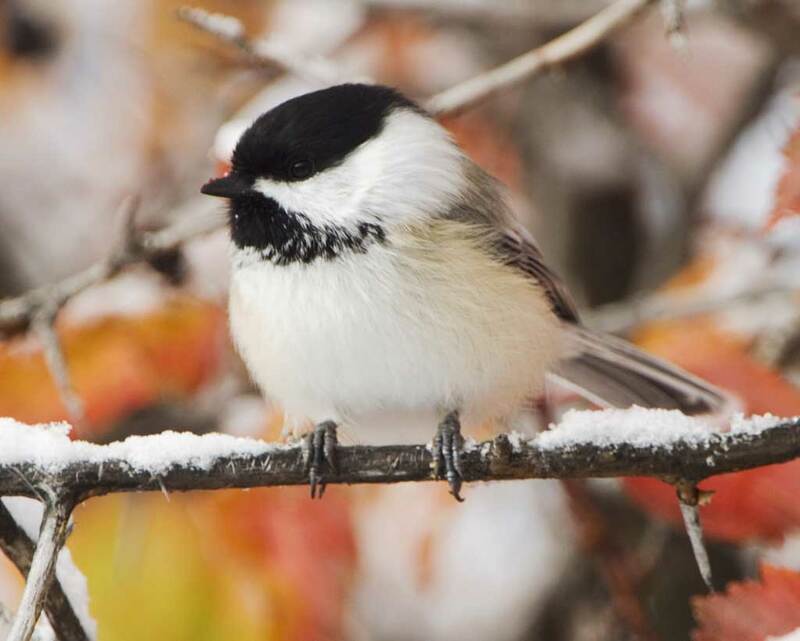 The chickadee is indeed a truly Emersonian bird, and the poet shows him to be both a hero and a philosopher. Hardy, active, social, a winter bird no less than a summer, a defier of both frost and heat, lover of the pine-tree, and diligent searcher after truth in the shape of eggs and larvae of insects, preeminently a New England bird, clad in black and ashen gray, with a note the most cheering and reassuring to be heard in our January woods,—I know of none other of our birds so well calculated to captivate the Emersonian muse. There it is, a Yankee bird through and through. Listen when you step outside. Good birding. Tired of the all the same Christmas tunes assaulting your eardrums every day? Here's something a little different... "Santa Claus" by Sonny Boy Williamson II, Mississippi-born blues harmonica player. If you've ever rummaged around the house looking for a stash of Christmas goodies, this song is for you. I wrote back in September that the Republican Party had, in embracing Trump, sacrificed ideological coherence as well as the capacity to build a political national consensus. No one knows what the GOP stands for any more, beyond holding power, and no one knows for what constituencies Republican leaders advance policies, other than their donors (which is to say, themselves). Such an existence cannot be sustained for long in a democratic republic. The party will either break apart or in their quest to retain power jettison democracy for authoritarianism. Both possibilities can occur simultaneously. While much of the media, especially those on the watchdog left, is obsessively charting the latter, the former process has already begun. The latest example is Kurt Bardella, former Republican staffer and Breitbart employee, who wrote a couple days ago in USA Today that Republican endorsement of Roy Moore caused him to leave the GOP and become a Democrat. Peter Wehner at the New York Times wrote yesterday about "Why I Can No Longer Call Myself an Evangelical Republican." (Wehner's not jumping ship just yet, but he's readying the lifeboat.) Meanwhile, Wehner's colleague at the Times, David Brooks, in another display of vomit-inducing pathos for the plight of the right-of-center, writes "More and more former Republicans wake up every day and realize: 'I’m homeless. I’m politically homeless.'" There are plenty of other examples in conservative punditry to point to from the National Review to Bill Kristol, from Max Boot to Tom Nichols. The columnists of the Washington Post, especially Jennifer Rubin, have been relentless in their condemnations of the GOP in the era of Trump. So far, though, such defections have occurred on the intellectual right. The rest of the party apparatus remains intact. Think of American conservatism as divided into three spheres: There’s the elite world of pundits and intellectuals (consisting of think tanks, policy journals, political magazines like National Review and The Weekly Standard, certain blogs, etc. ), the broader world of “the movement” (consisting of populist media outlets like talk radio and Fox News, diffuse activist groups like the Tea Parties, websites like RedState and its imitators, and issue-based pressure groups like the N.R.A. and the National Right-to-Life Committee, etc. ), and then the institutional world of the Republican Party (consisting of office-holders, staffers, fundraisers, consultants, etc.). It is fascinating to watch in real time the calving of the Republican glacier. The pundits and intellectuals have already begun to break away. "The movement" as Douthat termed it, seems to have largely cleaved to Trump, although there have been cracks there too. The Party itself (with the notable exception of Evan McMullin's run, and I would classify him a component of the intellectual right more than the Party apparatus anyway), has cohered, but the campaign of Roy Moore has put enormous strain on the Party. If he is elected, the forces of political entropy will be greater still. These things can fall apart quite quickly. Watch what happens on Tuesday. How to counter the daily dose of news-induced poisons? I've taken to birding. Birds are beautiful, they're everywhere, and they're unconcerned with the political quagmire in which humans have landed themselves. Consider this Snowy Owl KS and I saw just after Thanksgiving at Parker River National Wildlife Refuge. Magnificent in its supreme indifference to anything Trump says. It is a nerve wracking experience to follow the daily news cycle as if the fate of the nation hangs in each development. Whenever a story breaks about graft, corruption, broken norms, expanding plutocracy, and alt-right proto-fascist empowerment, it feels like further confirmation that, yes, the republic is collapsing before our eyes. Alternatively, every revelation about the special prosecutor's investigation of Trump promises a desperate salvation, like the kindling of a beacon fire or some other ancient defense of the people. Give it just a few more weeks and Mueller will arrive leading the Riders of Rohan to help win the great battle of our time. So it went at the end of last week, when ABC produced a stunning scoop that Mueller's flipping of General Flynn would produce testimony that Trump had directed Flynn to make contact with Russia during the campaign, a gigantic, potentially impeachable no-no. Markets fell as the End of Trump drew nigh! Then hours later ABC corrected the report to state that Trump had ordered Flynn to do this when he was president-elect, still potentially problematic but orders of magnitude less so than the original erroneous report. What followed from ABC was backpedaling and then, for me, the return of that feeling of visceral horror that the presidency remains in the hands of a lunatic narcissist for the foreseeable future. Mueller is not the answer. I have to remind myself that I should stop investing hope in that investigation. It will produce whatever it produces and, should it be damning or even criminal, even then we must count on the miraculous odds that a GOP House and Senate would carry out impeachment proceedings. Our national crisis runs far deeper than a campaign plot with Russia. It is not, however, altogether unprecedented or unfamiliar in American history. The nation has experienced plutocratic corruption and deep economic inequality before. It has experienced restrictive and unjust voting practices, white supremacist governments on the state and national level, and illegal anti-democratic conspiracies. It has experienced legally enforced segregation and nativism, as well as giant tribalist media outfits unmoored from real journalistic principles. It has experienced civil war. In all of these cases, tremendous suffering was inflicted on the American people. In other words, we are right to be apprehensive of this moment. But we should also take note that these crises were not resolved by the arrival of a white knight. They were resolved by the people, years, sometimes decades later. Such a timeframe might induce despair, but the agency should give us courage and confidence. Nothing more radical ever occurred in American history than the emancipation of slaves by proclamation in 1863 and by Constitutional Amendment in 1865. Few reversals were so tragic as the collapse of Reconstruction policies and the abandonment of freedpeople by 1877. W. E. B. DuBois wrote in his 1935 masterpiece Black Reconstruction, "The slave went free; stood a brief moment in the sun; then moved back again toward slavery." Such a retreat, we must remember, was aided and abetted (if not caused outright) by Northern white voters buying into a false history of the Civil War and its meaning (fake news, of a 19th century sort) in which the significance of white reconciliation smothered the emancipationist legacy of the war. The people abandoned in political and intellectual terms the very cause for which they had sacrificed so much blood and treasure. We must also remember how powerful the forces of white supremacy were in America after two hundred years of racial slavery. The startlingly swift and unlooked for abolishment of slavery could never have eradicated the structural forces underpinning slavery in those few short years. White supremacy was going to push back, with the weight of national history and national mythology on its side. In crude terms, we might interpret the rise of Jim Crow, tenant labor, lynchings, and the convict lease system as reversions to the historical mean, the reassertion in social, legal, and extralegal terms of white supremacy and control of black bodies. It is tempting and saddening to believe that Obama's presidency will be our "brief moment in the sun." (Ta-Nehisi Coates certainly thinks so.) I'm not so certain. I find myself wondering if Trumpism is the manifestation of American political white hegemony in the throes of panic as it faces demographic and actuarial threats. If the resistance is sustained, if anti-Trumpers (of all political stripes) continue to organize, march, protest, register, run for office, and vote, we stand a fighting chance. Our own historical mean is more complicated than what it was in 1877. In the last century, the United States fought and won two World Wars and a Cold War in the name of democratic values. It enfranchised millions of women and non-white citizens through progressive activism. The American people have folded these triumphs of the liberal state into our national mythology. We may yet regress into a herronvolk republic or become a full-fledged authoritarian state, but if we don't it will be our history that will save us. There were always three possible scenarios in a Trump presidency. The first was that Trump and his Republican majorities in Congress and the Supreme Court would swiftly pass a slate of regressive laws dismantling Obama era programs and undermining the Great Society. Naturally, this was the outcome liberals feared most, and with good reason. Republicans enjoyed a significant majority in the House and the advantage of an experienced parliamentary leader in the Senate. Trump didn't have to be an effective political leader in this scenario; he just had to sign the bills in between rounds of golf and then take credit for making America great again. How bright did the future look to Paul Ryan? He told the Republican caucus at their January retreat they would repeal the ACA, cut taxes, and fund the wall by August. The second scenario, far less likely than the first but still conceivable considering Trump's past as a New York Democrat and the Conservative apostasy in his campaign, was that Trump would cut centrist deals and govern as a moderate. He might, for instance, win some tax cuts and regulatory reform, but he would trade away the Ryan-McConnell ambition to end government healthcare. This was the scenario conservatives feared most and sometimes it still haunts them. The third scenario (the one that's actually come to pass), is that Trump is so colossally incompetent, unfocused, racist, and stupid that his administration has not been able to successfully guide any legislation of consequence through Congress. More surprising still, Ryan and McConnell have proven unequal to the task of wrangling the Republican majorities into passing legislation either. Scenario 1 would have been awful and 2 was probably a pipe dream, but that we are living through 3 sets a new problem into relief. What does it mean that a Republican Party can control such majorities and the White House and still not produce? Put another way, what is the purpose of the Republican Party? Relatively unencumbered by ideological mission, the two parties did not have enough intellectual focus to offer voters clear-cut alternatives. Thus they failed in one of the classic functions theoretically ascribed to political parties. But if they defaulted in this way, they performed admirably another equally important if less orthodox function: they promoted consensus rather than divisiveness. By encouraging men to seek a broad basis of popular support, they nourished cohesiveness within the community and avoided sharpening the cutting edge of disagreement to dangerous keenness. In that case it didn't last much longer. Eventually slavery drove a wedge between the Northern and Southern wings of both parties, destroying any hope for national popular support. The Whigs fell apart by 1852. The Democrats split in 1860 and barely survived the war intact. The current Republican Party proved they could win a national election, but only by merging contemporary conservativism to right-wing populism. (And even then, they still lost the popular vote.) In making such a bargain with Trump, they sacrificed whatever ideological coherence they had previously held on to. Nor does their appeal consist of "promoting consensus," to use Potter's words. Extraordinarily, the Republican Party, in firm control of the government, does not seem to be doing any good for any constituency. It is suffering an existential crisis in the midst of its electoral triumph. If things continue as they have, the party could fracture.